Performance classes were introduced to the Dubbo National in 2013 to encourage breeders to consider cattle that excelled in balanced, measured performance, were structurally sound and exhibited visual market suitability. Days Whiteface has won the EU Index performance class since its inception. In 2013 the class was won by Days Calibre G74, who went on to sell for a record $90,000. In 2014 Days Patrick H37 won the class and sold for $24,000 to Chester and Quamby Plains. 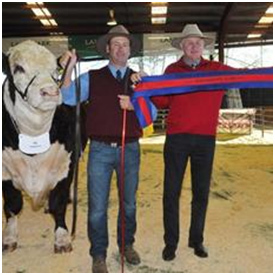 This year Days Enforcer J126 won the class and went on to sell for $27,000 to Mawarra Herefords.